Click here to inquire about a custom painting/reproduction of the above painting. When ordering or inquiring, please do not forget to mention the item # of this painting. This painting that I did in May 2013 is a tribute to friendship and growing together as individuals. It depicts two souls, one a marten, the other a sturgeon, who have been companions (perhaps even lovers) for thousands of years and hundreds of new births. Always equal. Always looking after each other. Always searching upon arrival of each new world for the other. Once finding each other again, running, laughing, playing and learning together again. This is not just a romantic tale. It is a story about finding balance and learning acceptance. Acceptance of each new situation. Learning by learning how to find each other and walk whatever path chosen for them in this life. The red and yellow of the fire in the painting symbolizes giving life to the people as depicted with the red and yellow circle in the male figure's arm - which is all also the centering point for the female. 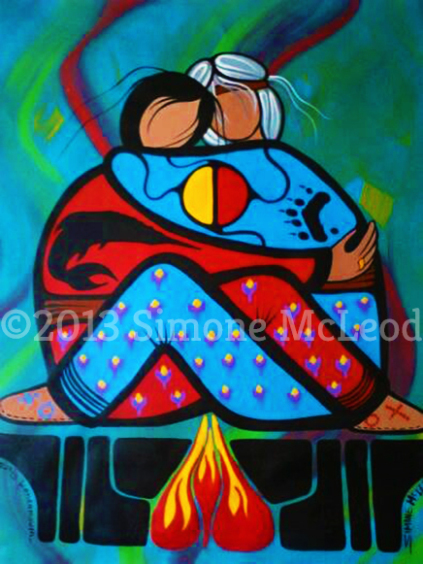 It tells a story of Trust, Kinship, Strength and many other of the virtues I paint into each painting that I do. I hope you all enjoy this piece.